Louis Kronberg was active/lived in New York, Florida, Massachusetts / France. 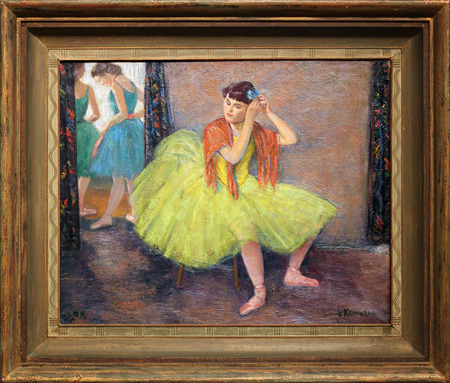 Louis Kronberg is known for portrait, theatre figures, dancers. Seller's Notes/Description: A very fine example by Louis Kronberg, painted in 1946 and reflecting the artist's most desired gesture. The painting is in excellent original condition and handsomely framed in a highly complementary Scrafitto frame. This museum-quality painting presents beautifully in real life. Please inquire.